Jeremy Stivener was born and raised in the City of Robinson. 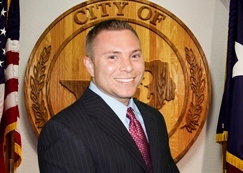 After graduating from Robinson High School, Jeremy continued his education at Baylor University, earning a Bachelor of Business Administration in Finance. While attending Baylor University, Jeremy was a member of the Financial Management Association as well as Phi Alpha Delta, an international law fraternity. Jeremy is employed by L-3 Communications in Waco, TX as a Business Manager. Jeremy and his wife, Jennifer, currently live in Robinson with their 2 children, Morgan and Zac.